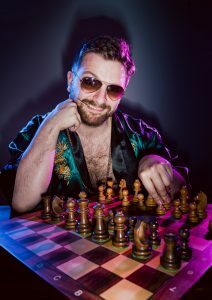 We caught up with one of the best up-and-coming comedians in the United Kingdom, Pierre Novellie, to talk being cool, being funny, being a bad audience member & MORE! Hi Pierre! Or is it Peter? Intriguing… Who is Cool Peter? He’s an abstract representation of how difficult it is to name a show. How cool would you say you are on a scale from socks-and-sandles to Bowie-and-Bing? David Bowie wearing socks and sandals. Who is the coolest person in comedy right now? It depends – there are comedians who are cool to the public and then comedians who are cool to other comedians. I am probably neither. You started out with the Cambridge Footlights – no pressure there, then! Did that feel like an important step at the time? It mostly just felt like messing around doing comedy with your friends! People will hold it against you if they find out you did it so you have to be discreet. Every single audience member who, upon being asked a simple, meaningless question by a comedian, realises that the answer needs to be rapid and brief rather than fully accurate. Who are your comedy villains? What are your favourite places to go to in London? I’m a sucker for a niche cinema – I’d sit in one for days and just let the films wash over me if it wouldn’t be seen to indicate a mental health issue by friends and family. Likewise diners, I’d sit in one and just let the beef wash over me if it wouldn’t be seen to indicate a mental health issue by friends and family. Don’t miss Pierre Novellie is Cool Peter at Soho Theatre, 18-20 April! Finding that the rewards of Warhammer might not have been quite so worthwhile as he thought in his youth, Pierre Novellie picks his way through an equally perilous adulthood, littered with rats and chicken bones – and that’s just the journey to the end of his street. That’s not cool. But then a dawning realisation that very little is cool helps Pierre start to feel good after all.